Mark Boyden, 35 and Princess Zahra Aga Khan, 26 met two years ago on a ski hill. They got engaged the 16th of December 1996. They are celebrating this saturday 21th June their wedding at Aiglemont. The wedding will be followed by a Ball at the Chateau de Chantilly. Princess Zahra was at Williams two weeks ago for the graduation of Prince Hussain. (Photos at the Timeline section of the Heritage Library). Four days after the graduation, on Thursday June 12th Prince Hussain joined her in London for the Ball given by Princess Salimah for Princess Zahra. 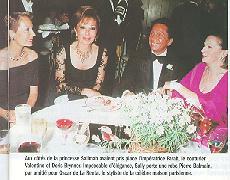 The ball was planned since last winter by Princess Salimah as a wedding present for Princess Zahra. 500 guests came to the Ball. They were welcomed by Princess Zahra and her fiance Mark Boyden, by Princess Salimah and Prince Hussain. Princess Margareth, Empress Farah, Princess Rosario of Bulgarie, Prince Wenceslas of Liechtenstein, and many more, all came at the Claridge's to congratulate the couple. Came The dressmaker Valentino and came the actress Joan Collins. 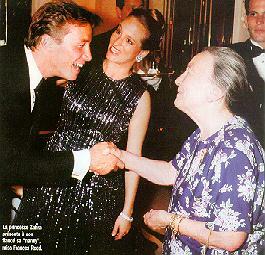 Mark's parents who live in the Dorchester were there and also Princess Zahra's "Nanny", Miss Frances Reed. 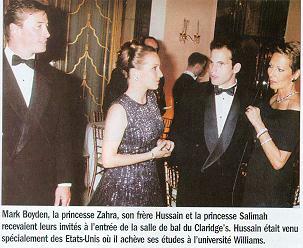 Princess Salimah and Princess Zahra both had a dress designed by Pierre Balmain and Prince Hussain had an elegant Black Tuxedo and a bow tie. Princess Zahra's long dress was green/blue shining and she wore Van Cleef earrings and a white bracelet which suits her perfectly. Mark Boyden looked even more handsome in real then in photos. He was smiling at everyone and .. he was blushing! They danced with love in their eyes, and so did the guests up to almost four in the morning.